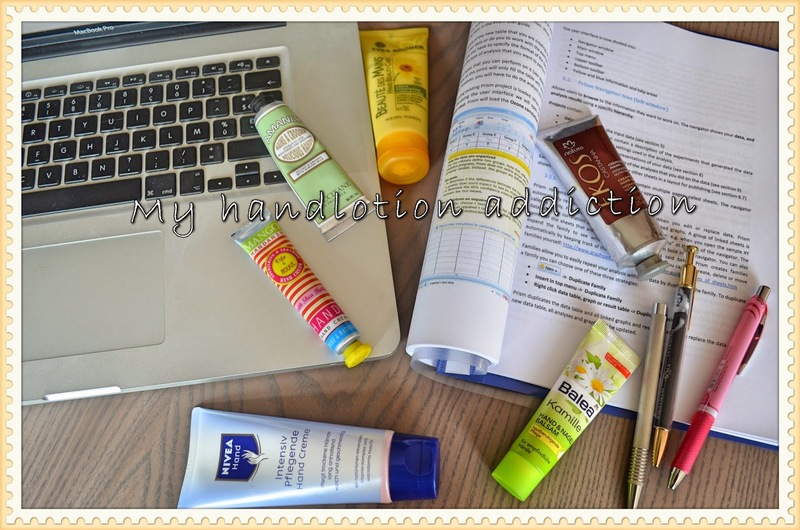 Sciencekoekje: My addiction to hand lotions: winter stash. I will let you in on a secret, i just love to lotion my hands and take a sniff at them if i need a wellness pick me up during the day. Especially if i have one of this insanely long working days, there is just nothing better, then to put a handlotion on. Massage it in and take a deep sniff and forget the world arround you. I know i am weird but i actually try to do this now instead of grabbing for chocolate. I am a very scent oriented person and scents come with memories and feeling of relaxation. So well, there is no suprise that i also own quite some handlotions because i never want to be without one. Especially in the wintermonth when it is cold outside but to be honest also all year long. I work in a lab and obviously i wash my hands a lot, so i get dry hands really fast. So without further ado, let me introduce you to my small collection. I intentionally prevent myself from buying to much more since those things do have a shelf life. So in a few month i might own 5 different ones again (though i do have clear favourites, but i will tell you more later). 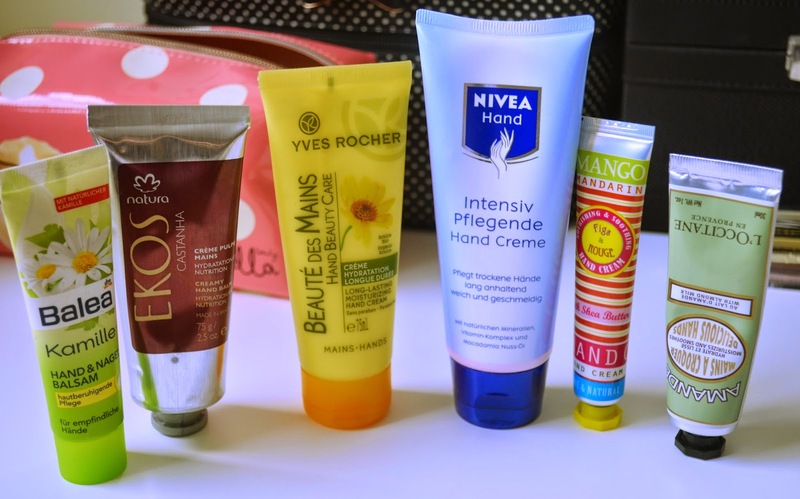 1) Is the Balea Camomile hand and nail lotion: This little tube costs under a euro in the german DM and is suprisingly good. It moisturises my hands very well and leaves a soft Camomile scent. I can never resist to buy one or two of these for my handbag since due to their price they are great for the handbag and also great to share if somebody else is in need. (yes i am possesive about my expensive ones :P, but in my defense, the people i share with usually do not care about the scent and this one does a perfectly good job in moisturising). It also sinks in very fast, so a good recommendation for people on a budget. 2) The natura Ekos Castanha creamy hand balm. This hand lotion got sent to me in a birch box. I have a lot of brazilian collegues and they have told me that this is the number one cosmetic brand in brazil and that they even went through some length to get that here. I tried and i do get why. It is a very thick balm which wonderfully moisturises my hands while still sinking in very fast. What i love about this product is that it is free of parabens (as far as i can see) and contains a lot of natural ingredients. This one right here is based on Castanha oil and promises to not only provide 24h hydration but also to stregthen my nails. I do not know about the 24 hour hydration because i do not think i ever go that long without taking a shower or atleast washing my hands with medicinal soap (lab). But i do know that i do love this handcream. I will probably go and buy another one when this one is out. 3) The Yves Rocher Beauté de Mains: This is a well known and well loved hand lotion which i always end up having. Either my mum buys it, i get it for free when i shop there or its on offer and the shopping goblins want it. It is a very nice handlotion which moisturises nicely. I would put it similar like the Balea one under the budget hand lotions. Definitely nice one and like all Yves Rocher products also free of animal testing. I often have this standing arround my office for quick hydration on the go. The scent is nice enough but nothing special. 4) The good old Nivea Hand lotion. This is one of this lotions which always end up in my house even though i do not know where they come from. This is a nice standard hand lotion. Moisturises sufficiently but i am actually a bit bored by it so i would not buy it again. It does not do anything for me which other handlotions can't do better. 5) The Fig and Rouge Mango Mandarin Hand lotion. This was also a product i got via a subscription box. This is really one working for me with its beautiful fruity scent. I moisturises nicely. Sinks in fast and leaves a beautiful scent on my hands. Also, i just love the cute packaging. This is by the way a UK based brand. I will keep this tube though now for next year since i find the scent more appropiate for summer time. While writing this post, another blogger posted about the Yves Rocher Christmas ranges and i noticed that i had completely forgotten that i had gotten this as a gift, last time i bought something at Yves Rocher. So well i found it back and gave it a quick try to still include it in this post. Let me say i was very very positively suprised. 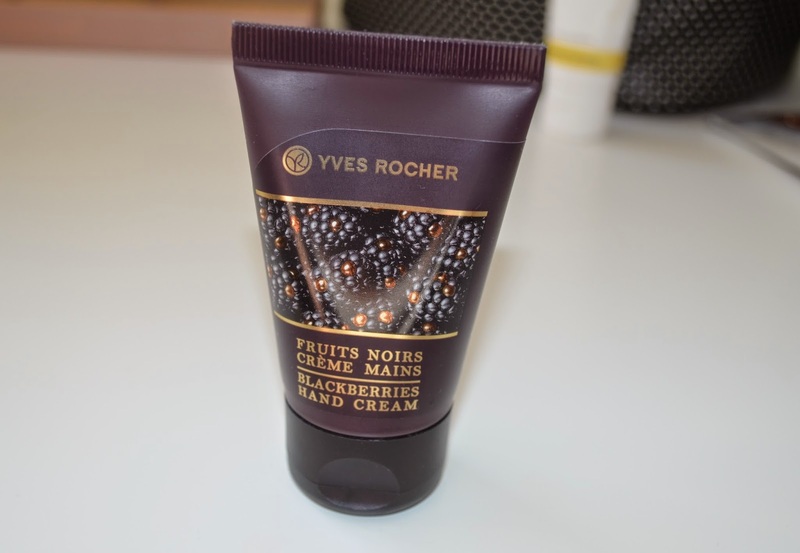 This Yves Rocher Blackberry hand cream is not only way more moisturising than the other Yves Rocher lotions so far it also has the most delicious autumy dark berry scent i ever smelled in a hand lotion. So i was sitting at my desk sniffing my hands like a crazy person which earned me some seriously weird looks from the hubby (but well; he is married to me, so he is used to a lot). So if you are looking for an autumn handlotion, give this a go. I am already thinking of getting a bigger tube. So this was my handlotion stash. Can you tell that i am addicted ;). Do you have any skin care additions? Am i the only one taking such a pleasure at smelling freshly lotioned hands? And most importantly, any good hand lotions i may not know about? Let me know! !